We all know it’s true: Half the fun of summer is outdoor drinking. There’s no better feeling than a cold beer on the beach, or that first glass of rosé on the patio. But summer drinking should be simple drinking -- even a cocktail nerd like myself isn’t bringing a set of jiggers and shakers to the beach. So what’s to be done, if you’re looking to up your summer cocktail game? Pre-batch. 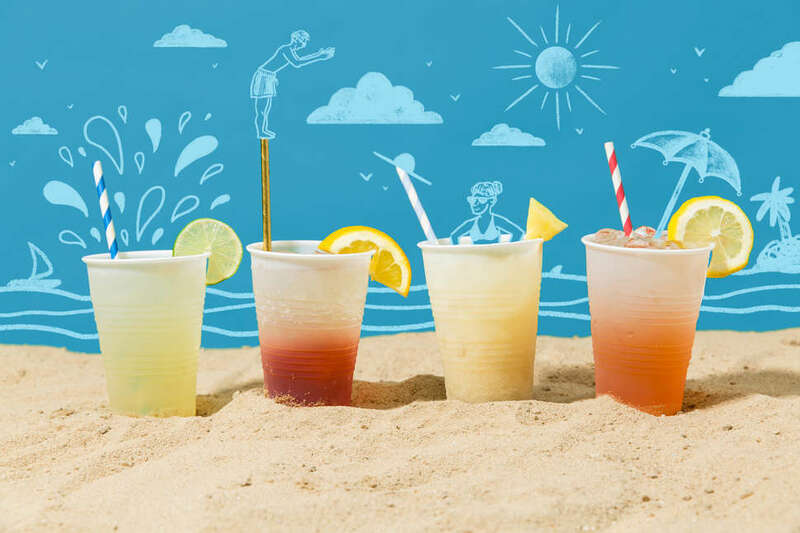 Spend a few minutes in the kitchen the morning before your party or beach trip; make a big batch of the cocktail, and stick it in the fridge; then just pour it out at the beach, zero effort required. This system works equally well for a picnic at the park, a backyard cookout, or wherever else you’re headed this summer. Get a good bottle. These recipes each make six cocktails, and a whole batch can fit in your average Nalgene. Use whatever container you like, just make sure it seals fully -- nothing worse than losing a cocktail batch in a sticky cooler mess. If you’ve got a pitcher that seals well, feel free to double the recipes. Keep as cold as possible. Pouring cocktails over ice at the beach is pretty much mandatory. No one’s ever enjoyed a warm margarita. (Just grab a $2 bag of ice at the grocery store or bodega. If half of it melts at the beach, you’ve still got plenty.) If possible, chill your cocktail container, too. Store your pre-batched drinks in the refrigerator -- or for a quick chill, the freezer -- until you head out the door, then keep in a cooler with ice packs until you’re ready to drink. Garnish is optional, but. Since you’re schlepping these things to the beach, we’ll say what bartenders rarely say: Garnishes aren’t required. But it takes three seconds to slice up a lime and toss it into a Ziploc, and how much cooler will your margaritas look? 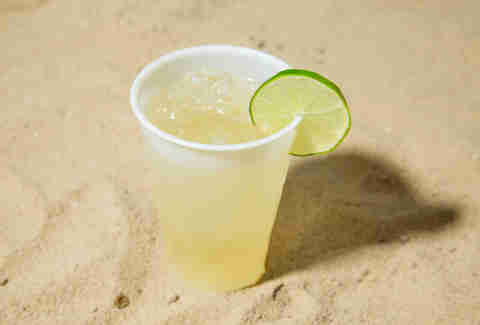 There are several styles of margaritas out there; those sweetened with orange liqueur, and those sweetened with agave. For beach drinking? We prefer the agave version, a little lighter and cleaner. Fresh lime juice is the key to a great margarita -- juiced that morning or, if necessary, the day before. Note: While they go down easy, these are fully loaded. Swim/surf/tan responsibly. Indoors: Make agave syrup: Dissolve the light agave in hot water, and stir until dissolved (this helps the thick agave syrup mix into the cocktail). Add it to a sealable container, along with tequila, lime, and additional water. Stir to combine, then cover and refrigerate until ready to go. If possible, keep chilled in a cooler, with ice or chill-packs, as you’re headed to the beach. Outdoors: Give the container a good shake, then pour out into six cups with ice. Add a lime wheel to each, if using. What more introduction does “spiked strawberry lemonade” need? (It’s spiked sparkling strawberry lemonade, to get even more specific.) Since you’re making the cocktail ahead of time, there’s no need to muddle or smash the strawberries; they’ll steep in the drink itself, releasing their flavor and color with no work required on your end. Feel free to swap out the vodka for gin or white rum, if that’s more to your liking. And hey, cocktail nerds -- a big splash (say, 2 ounces per batch) of Campari would be great in this, and amp up the rosy color, too. Indoors: Combine vodka, lemon, and simple syrup in a sealable container and stir to combine. Slice strawberries (tops removed) and add to container. Refrigerate until ready to go. If possible, keep container and sparkling water chilled in a cooler, with ice or chill-packs, at the beach. Outdoors: Give the container a good shake, then pour out into six cups with ice. Pour 2 ounces of sparkling water on top of each drink (you’ll use up around ¾ of the bottle). Add a lemon wheel to each, if using. Rum, lime, mint, soda -- what’s better for the beach than a mojito? Here’s the only problem with making mojitos ahead of time: If the mint’s left sitting in a cocktail for too long, it can get a little slimy. We’re solving that issue by making a mint simple syrup. (It’s as easy as making tea: Pour hot water over mint. Let steep. Stir in sugar. Strain and you’re done.) This way, you’ve got vibrant mint flavor without any warm, limp mint sprigs. And it gets even mintier when you bring more fresh mint along, and drop it on top. Heat up 4 ounces of water until boiling. Pour over cleaned fresh mint, and allow to steep for 15 minutes. Stir in the sugar, until dissolved. Strain out mint, reserving syrup, and chill until ready to use. Indoors: Combine rum, lime, and mint simple syrup in a sealable container and stir to combine. Refrigerate until ready to go. If possible, keep container and sparkling water chilled in a cooler, with ice or chill-packs, at the beach. Outdoors: Give the container a good shake, then pour out into six large cups with ice. Top with about two ounces of sparkling water. Add some fresh mint to each. A lesser-known classic, the Brown Derby is a gem of a summer drink, taking bourbon and lightening it up with grapefruit and honey. 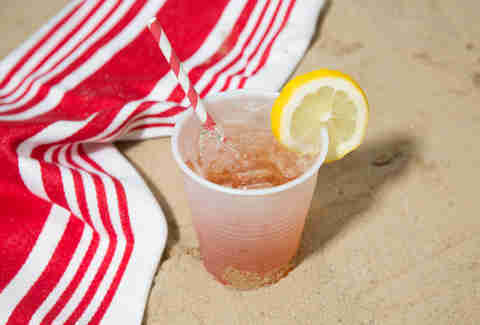 We’re adding a big splash of soda to each, making them even more refreshing and beach-friendly. Indoors: Make honey syrup: Dissolve the honey in hot water, and stir until dissolved (this helps the thick honey mix into the cocktail). Combine honey syrup, bourbon, and grapefruit in a sealable container and stir to combine. Refrigerate until ready to go. If possible, keep cocktail container and sparkling water chilled in a cooler, with ice or chill-packs, at the beach. Outdoors: Give the container a good shake, then pour out into six cups with ice. Top each with around an ounce of sparkling water. Add a grapefruit wedge to each, if using. OK, there’s no way to bring a blender of still-slushy piña coladas to the beach, unless you’ve got some kind of mad-scientist liquid nitrogen setup. And a battery-operated blender. (And if so, we’d like to see it.) But it’s easy to have an ice-cold version that’s just as delicious. The key: Whizz the whole drink up in a blender ahead of time to help the ingredients combine. Then pour it into a sealed container and chill; give it a HARD shake before pouring it out; and you’ve got an airy, frosty version so good you won’t miss the slush factor. 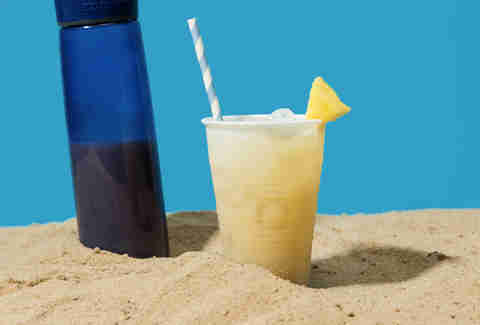 Indoors: Combine rum, pineapple juice, coconut milk, lime juice, sugar, and water in a blender, and give it a quick whizz. Pour into a sealable container and refrigerate until ready to go. If possible, keep chilled in a cooler, with ice or chill-packs, at the beach. Outdoors: Give the container a HARD, hard shake, then pour out into six cups with ice. Add a pineapple wedge to each, if using. Every cocktail nerd loves a bittersweet Negroni, but even for the hard-core, they’re a little too boozy to enjoy in the searing-hot sun. The answer? Prosecco, clearly. Top a slightly smaller version of a classic Negroni with ice-cold prosecco and you’ve got a much lighter version, refreshing and summer-friendly. 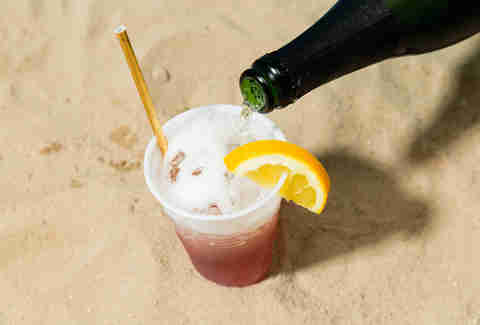 You will be the classiest drinkers on the beach. Guaranteed. Indoors: Combine gin, Campari, sweet vermouth, and water in a sealable container. Refrigerate until ready to go. Keep cocktail container and sparkling wine chilled in a cooler, with ice or chill-packs, at the beach. Outdoors: Give the container a swirl, then pour out into six large cups with ice. Top each with around 2 ounces of sparkling wine. (You’ll have around half a bottle left. We assume you’ll know what to do with that.) Add an orange wedge to each, if using. At many bars, “Mai Tai” stands for “Shake up rum with whatever random juices you have on hand.” But the classic cocktail is awesome: rum, lime, orange liqueur, and the almond syrup orgeat. As with the piña colada, thicker ingredients (in this case, the orgeat) need a little more muscle to come together. So whizz a whole batch up in the blender before you go, and the cocktail will be perfectly mixed when you’re ready to pour it out. The garnish you really want here — a paper umbrella. Indoors: Combine rum, lime juice, orange liqueur, orgeat, and water in a blender, and give it a quick blend. Pour into a sealable container and refrigerate until ready to go. If possible, keep chilled in a cooler, with ice or chill-packs, at the beach. Outdoors: Give the container a hard shake, then pour out into six cups with ice. Carey Jones is the author of Brooklyn Bartender and never met a Negroni she didn't like. Follow her on Twitter.